Today (March 29, 2010) we did more large prescribed burns. 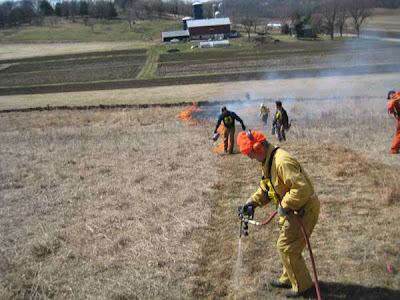 We did savanna and prairie burns at Pleasant Valley Conservancy, and prairie burns at Black Earth Rettenmund Prairie. Both of these are State Natural Areas. We had a crew of 11, some paid and some volunteers. All of the personnel were quite experienced and the burns went very well. Since we are in the part of Dane County that is under DNR Fire Control, we are required to have a permit to do daytime burns. 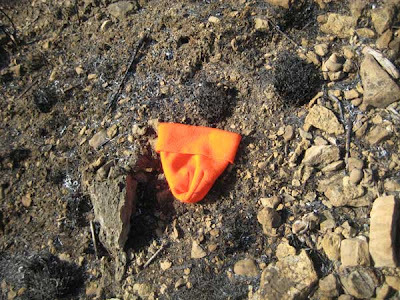 Permits for all of our planned spring burns are issued in the middle of March, but we are also required to have verbal DNR approval on the day of the burn. This leads to some nervous times, as I never know when I call DNR if the burn will be "on" or "off". I have some idea of when burns might be canceled, and by following NOAA weather I can often anticipate things. Today seemed like a likely burn day, and I was correct, as we were told to go ahead. In the morning, at Pleasant Valley Conservancy, we burned 36 acres of bur oak and white oak savanna, as well as two planted prairies, Toby's Prairie and the Pocket Prairie. Despite the cool weather and light winds, coverage was quite good. I attribute this to the fact that there has been no significant rainfall for many days, so that the fuel moisture content was low. The photo below shows parts of Units 10 and 19B soon after the burn was completed. The fuel in these savannas is mostly oak leaves, but there are also areas with less tree canopy where prairie grasses predominate. Both fuel types burnt well today. After lunch we moved to Black Earth Rettenmund Prairie (a few miles away) and burned about 12 acres. We always alternate our burns here, burning the north unit one year and the southern two units on the alternate year. This makes for somewhat tricky burns, as there are no natural fire breaks between the two areas. In order to control the burn, we make good use of our pumper unit, wetlining along the fire break. The photo below shows just the start of the burn. Kathie is wetlining and I am driving the Kawasaki Mule (with its pumper unit). We also had lots of other people with backpack watercans to jump on any potential problems. 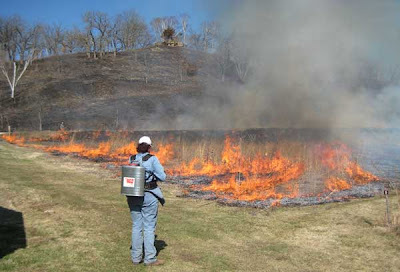 Prescribed burning is fun but challenging, and somewhat nerveracking. But what a feeling of accomplishment when a successful burn has been completed! I didn't know it was so rocky! After our south slope burn last Tuesday, Megan said: "I didn't know it was so rocky!" As an intern, she had worked on that south slope all last summer, pulling sweet clover, herbiciding sumac, cutting invasive shrubs. But when vegetation is present, you don't really notice the rocks. The soil map classification for this slope is "stony", and there is obviously a reason for it. I think the photos shown here are convincing. The first one shows the south-facing slope in the fall when little bluestem is in full seed. You can see the occasional rock, but the slope looks fairly lush. Now, look at the second photo, taken a few days after our burn of March 23, 2010. Rocks everywhere! 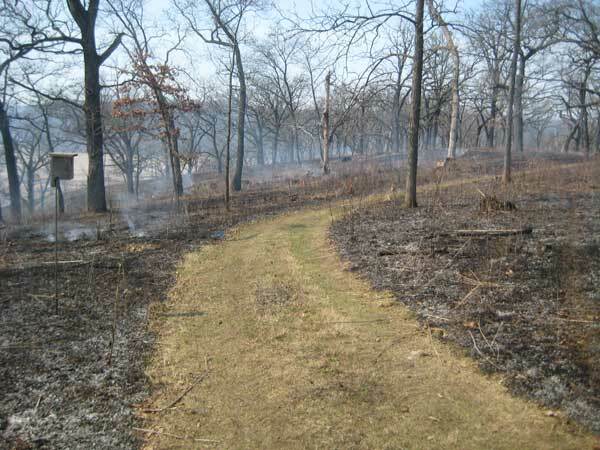 Finally, the closeup shows what the little bluestem looks like after it has been burned. The black clumps are scattered among the pebbles and rocks. You can imagine the root systems of the little bluestem plants snaking down through the rocks.The amazing thing is that large bur oaks are also living upon this slope. Not only living, but thriving. Some are over 150 years old. Also, our property is not unique. All the other steep hills in this area have more or less the same composition. Before we burn our savannas, we spend quite a bit of time clearing around snags (standing dead trees) and birches (standing living trees that are especially handsome in the woods). 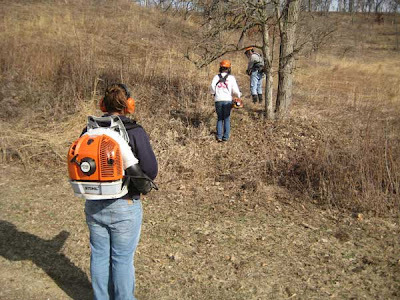 We use a Stihl brush cutter equipped with plastic flails to clear around each tree. We use plastic flails rather than a metal saw blade so that the bark of the tree is not damaged. 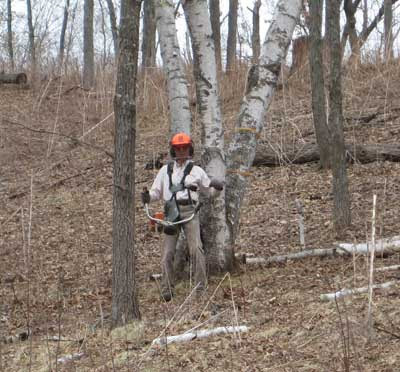 We follow with a large Stihl leaf blower and clear all the debris resulting from the brush cutter. We also clear all leaves, and pick up any woody material that is touching the tree trunk. It takes about four people-days to clear around all the trees in our 37 acres of upland savannas. This effort is probably worth it, because it greatly lessens the mop-up work otherwise needed after the burn. In addition to snags and birches, Kathie also likes to clear around large white oaks, because their bark is relatively thin and it would be a shame to lose to burns a 150-year old tree. The weather is finally cooperating and we were able to get in a lot of burns today. 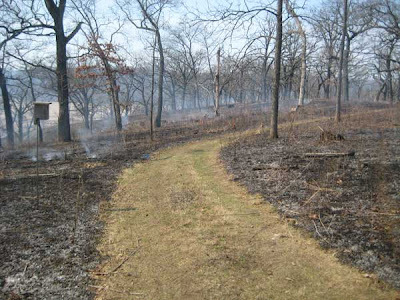 We burned the south-facing slope (about 13 acres), which is short-grass prairie remnant on the lower part and bur oak savanna above. We then burned about 9 acres of wet-mesic prairie adjacent to our wetland. The humidity was fairly low (25-30%), making it really easy to carry out these burns. 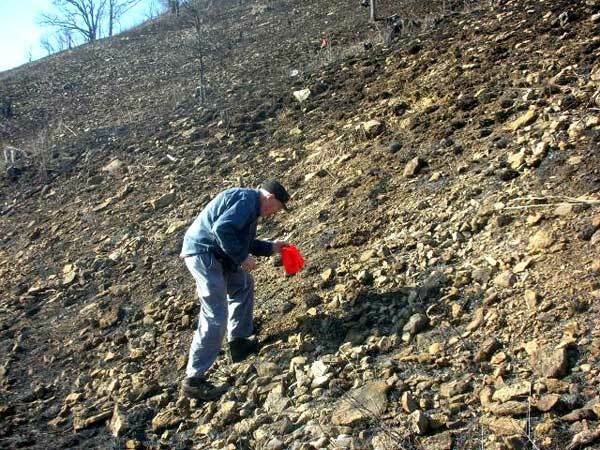 We always burn the south-facing slope carefully to keep the flame heights low. We use the strip head fire technique, which takes quite a few drip torches, but provides maximum control. We start at the top of the slope, at one end of our permanent mowed fire break, and make a wide black line to the other end. We use two or three drip torches for this. One operator ignites exactly on the fire-break line, and the second lights about 25 feet further downslope. If available, a third drip torch is about 50 feet further down. We move fairly slowly to be sure we are getting a good wide black line. The photo here shows the black-line group in action. Once the black line is half way across the slope, another drip torch starts at the beginning about 100 feet further downslope and lights a line. This creates a head fire which cannot move uphill very far before it reaches the upper black line and goes out. Two or three more drip torches spread out below follow, each staggered so that no drip torch operator is in danger. Today, we began lighting at 12 noon and finished the whole burn at 2 PM. After a brief snack, we started on the wet-mesic prairies. Generally, this early in the season these prairies would still be fairly wet and would not burn well. Not this year. The low humidity weather really dried them off, and we got close to 100% burn coverage. The photo below shows the tail end of the Valley Prairie burn. You can see the already-burned south slope in the background. 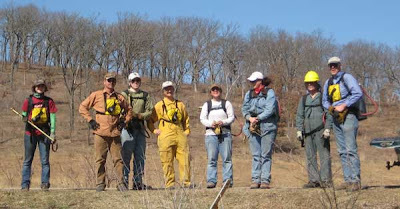 We hope to do our major oak savanna burn on Thursday, March 25. Join us! 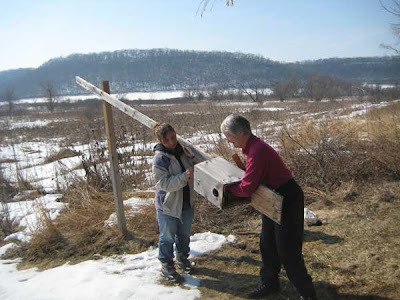 We have lots of bluebirds at Pleasant Valley Conservancy, using either natural cavities or artificial boxes that we have installed. 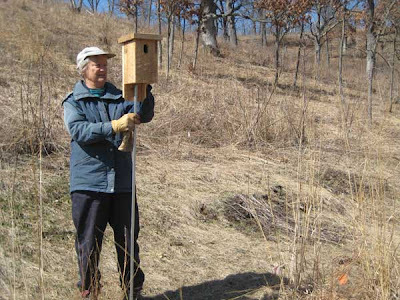 Saturday Kathie and I volunteered at Madison Audubon's Goose Pond Sanctuary to help finish work on 100 bluebird boxes that another volunteer had made this past winter. We helped installed the hardware needed to mount the boxes on poles. As recompense, Mark Martin gave us 4 boxes to install at Pleasant Valley Conservancy. These join the 8 that we installed about five years ago. Yesterday (Sunday) Kathie and I installed these new boxes at Pleasant Valley. Each box is fastened to a hollow metal conduit pipe, which slides over a 1/2" rebar. The rebar is pounded into the ground with a post driver. This arrangement works very well and the houses are quite stable. Our main problem is the bedrock close to the ground surface. We have to probe around to find cracks in the subsurface rocks large enough so that the rebar can be driven in. The eight old ones have held up very well, and we generally have had at least 4 of them used by bluebirds. So we now have 12 boxes, each numbered so that we can keep track of nesting success. Today, we flushed a bluebird out of box #3 as we drove by. They won't be laying eggs for a while, but they should be starting to build their nests soon. We are working hard right now to do basal bark treatment of woody shrubs and brambles on areas that we plan to burn soon. 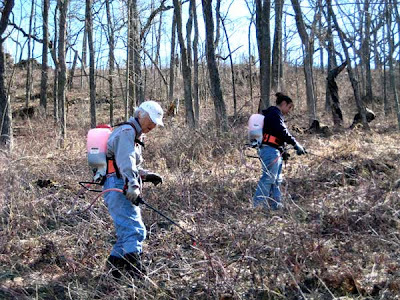 Since the burns top-kill these shrubs, we must get the treatment in before the burns. We spend quite a bit of time trying to figure out what is the best way of doing basal bark treatment. A lot depends on the size of the shrubs. 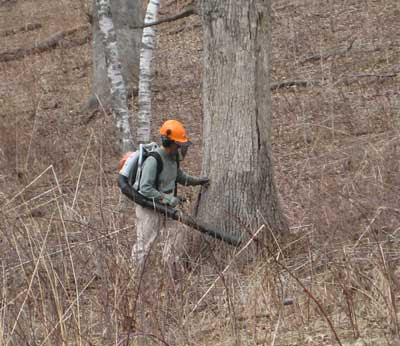 For large shrubs, such as "old-growth" honeysuckle or buckthorn, the use of a backpack sprayer is the best. However, most of our shrubs are fairly small, arising from regrowth from a seed bank. 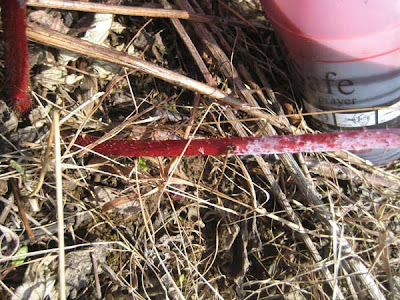 Spraying with the backpack is wasteful of herbicide, and it is difficult to confine the spray just to the target stems. My own preference is to use a hand-operated spray bottle, which permits quite accurate placement of herbicide, as the photo shows. However, if the site is flat this involves a fair bit of stooping. 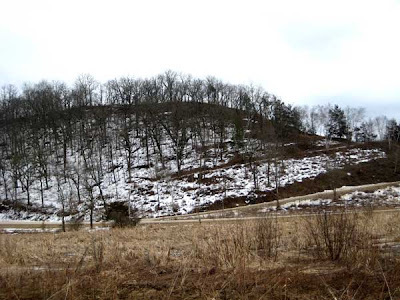 But on road cuts or slopes, such as we have quite a bit of here in the Driftless Area, stooping is minimal. Yesterday afternoon Susan and I treated the woody plants on the road cut above the Valley Prairie. When we planted the Valley Prairie in 2002, this road cut had been heavily wooded, since it escaped the plow. A contractor cleared it in the summer/fall of 2002, removing many large buckthorns and honeysuckles (both dripping with berries! ), as well as a large number of elm, cherry, and walnut trees. The undesirable seed bank was confined mostly to the road cut, and about six feet below on the level. Although we planted the road cut, understandably it did not "take" very well, and we have been battling woody vegetation ever since. The first few years we spent a lot of time with brush cutters. Gradually, prairie got established on the road cut, which now burns fairly well, thus helping to control the brush. But we still get new shrub growth each year, plus lots of brambles. The principal brambles are black raspberry, which tends to sprawl out over the ground. There are also some dense clones of red raspberry, which are a pain to work on. And there are even the occasional blackberry, which is the easiest to basal bark. Our basal bark mixture is 4 parts of Bark Oil LT, 1 part of Garlon 4 (or Element 4, its equivalent), and a healthy dollop of Bas-Oil Red dye. I find that if I grab upright stems with my left hand and pull back, I can direct the spray to the base of the stem and have little waste. With the small stems we are dealing with, it is not necessary to spray both sides of the stem. 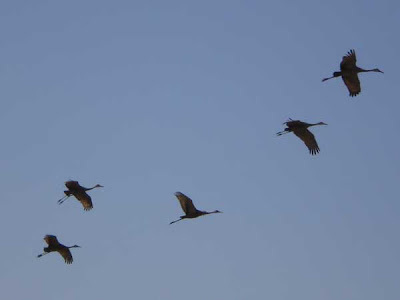 Right now the sandhill cranes are very active in our wetland. A pair has been exploring the area, presumably looking for a nesting site. And there is a group of five that are hanging out together. While we were eating lunch yesterday, the five flew low in front of us. We all grabbed our cameras, but Amanda got the best photo, shown here. After circling quite a bit these five finally settled down, very appropriately at the edge of the Crane Prairie! Burn season is almost upon us and among other things we spent yesterday making fire breaks for our first burn: the south-facing slope. We have a permanent fire break at the top of the hill, which needs little work, and Pleasant Valley Road serves as the break at the bottom. But we need a break at each end of the slope. Susan, Megan, and Amanda did those breaks yesterday. Susan and Megan ran two brush cutters and Amanda followed along with the leaf blower and cleared off all the debris. The photo shows them just starting at the bottom of the hill. They went all the way to the top, where they connected to the permanent break. Then they went to the other end of the hill and made the break that runs up around the quarry, along the ridge trail, and up to the top of the hill where it joins the permanent break at the other end. In the afternoon, Amanda and Megan used the brush cutter and leaf blower to clear around dead snags and living fire-sensitive birches on the whole south slope. 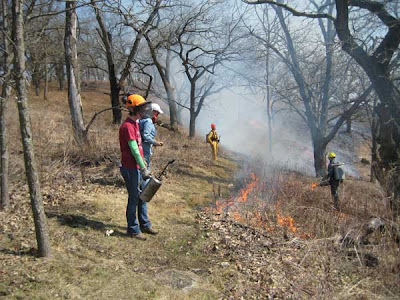 We plan to do the south slope burn next week, weather permitting. Last September I published in Ecological Restoration a paper on the ecology and conservation of purple milkweed (Asclepias purpurascens). This handsome species, endangered in Wisconsin, grows best in oak savannas or open oak woodlands, and popped up spontaneously at Pleasant Valley Conservancy after we began restoration work about 10 years ago. Unfortunately, the published paper could not include the color photos, but the downloadable PDF contains them. This is a fairly large file, so be patient when downloading. I thought the snow would never leave and then over last weekend it dramatically disappeared! This gave us the opportunity we needed for spraying honeysuckle resprouts on the N-facing slope. The photo above shows what the snow looked like on Friday, March 12. The area we needed to spray is on the left side of the picture. This had been an area with a substantial patch of large honeysuckles, which a contractor cleared about 5 years ago. We had burned it once after it was cleared, but then had to let it remain idle. Naturally, there was a honeysuckle seed bank and lots of new plants came up. We planned on dealing with these plants, but the deep winter snows had made it impossible to find the plants, which were relatively small. This past winter was another deep snow year. We've been waiting over for two years to spray. When we arrived to work on Monday, March 15, the snow had disappeared. What a surprise, as it had not been all that warm. But the relatively humidity was really low, and on Sunday the temperature was up in the 60s F. Whatever we had planned to do on Monday was dropped and we turned to spraying honeysuckles. We used the basal bark technique with Garlon 4 dissolved in Bark Oil LT, to which we added an oil-soluble dye. In addition to honeysuckles, we sprayed any other woodies, as well as brambles (black raspberry, mainly). It took about 26 people-hours to spray the approximately 6 acres. The brambles were a little maddening, since they kept tripping us up. Why did the snow leave so fast? I think the low relative humidity had a lot to do with it. A dry polar air mass moved in from Canada, bringing the low RH. Since the rain is keeping me inside, I am doing more work on my 2009 field data for Pleasant Valley Conservancy. The table below is a summary of 8 years of plant species check lists. 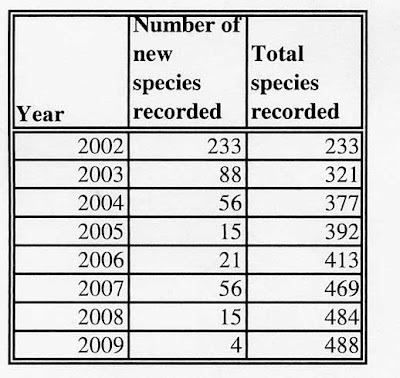 It gives the number of new species found each year, and the total number of species. Reasonably, as the years go by I am finding fewer and fewer new species. I am probably getting better at identifying plants, and keeping better records. The marked increase in new species in 2007 was because that was the year we hired Josh Sulman to do some detailed work on sedges and other wetland plants. I found only four new species during the 2009 field season, two of which we had planted: Helianthus occidentalis (western sunflower) and Senecio aureus (golden ragwort). The other two were spontaneous. One was Scutellaria parvula (small skullcap), a tiny purple-flowered plant that we found on the dry sandy south-facing slope (especially in Unit 6). According to Cochrane and Iltis, this species is common on dry habitats in the Driftless Area, which is right where I found it. 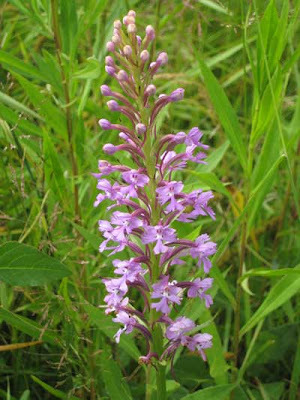 The other new species (see photo below) was the spectacular lesser purple prairie-fringed orchid (Platanthera psycodes), which we did not plant. It popped up spontaneously in the Valley Prairie (which we did plant). My explanation is that this orchid is living somewhere else in the wetland or wet-mesic area of our marsh, and managed to work its way into a similar habitat in the Valley Prairie. Although not rare or endangered, it is not especially common in Wisconsin. Now that we know we have it, we can look more carefully in suitable sites on the Conservancy. According to the Orchids of Wisconsin (Hapeman, UW-Madison Department of Botany), this species is probably the most beautiful orchid in the Wisconsin flora. The year 2010 may be the year I quit taking detailed field notes of plants, since I have obviously reached the limit in finding new species at Pleasant Valley Conservancy. I'll take a copy of the 8-year check list with me (probably in a portable computer) and use that to cross check anything I think might be new. With 488 species, it is difficult to remember whether you have seen something before. 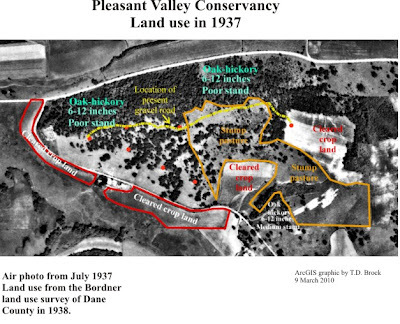 I have been using ArcGIS to get insights into the early vegetational history of Pleasant Valley Conservancy. Chris Noll, one of our former interns, helped me work out the approach, and I have now been able to use the 1937 air photo, plus the 1939 Bordner Wisconsin land use survey data, to relate the historic to the modern vegetation. See the photo below, and the detailed explanation at my web site. Today we cleaned out the kestrel houses and put in new wood shavings. We have two kestrel houses and one of them has been used for the past three years. As the photo shows, this house sits at the edge of the wetlands. Nearby is a large tree, and up the hill from there is a major bur oak savanna. Apparently this is good habitat for kestrels. 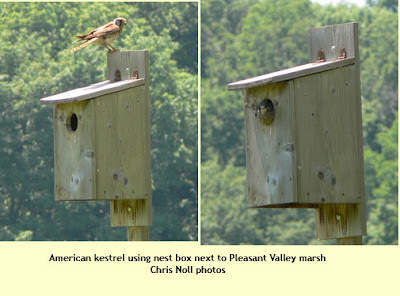 Kathie and I built the kestrel houses from plans I found on the Internet. The mounting arrangement is a design used by Mark Martin at Goose Pond. The house sits about 15 feet off the ground. The mounting pole hinges so that it can be brought down for cleaning. It took a fair bit of pounding to loosen up and scrape out the contents. After the house was clean, it was stocked with a couple of large handfuls of clean wood shavings. Getting the house back in vertical position is not easy, as the house and pole are fairly heavy. In a pinch, two people can do this, but three are better. The photo below shows the house in mid summer, when it was being well used. Last Saturday Kathie and I joined a group of volunteers to plant some prairie and wetland areas at Madison Audubon Society's Goose Pond Sanctuary. The day was crystal clear and warming up, virtually windless, so we ended up in shirt sleeves. One of the jobs Kathie and I had was to plant some wet areas at the edge of Goose Pond. These were areas that had flooded during the heavy rains of 2008-2009. After the water receded, a contractor came in with a front-end loader and did what is called a "scrape", creating a depression where water can accumulate during wetter areas, thus encouraging shorebirds and other waterfowl. As the photo shows, the snow and ice were starting to melt, but the surface was still hard enough so that we could walk around and toss out seeds. We planted a mix of water plantain ( Alisma triviale) , Pennsylvania smartweed (Polygonum pensylvanicum), and a few other emergent aquatics. These are annuals whose seeds can remain alive but dormant during lengthy dry periods, but then germinate and form extensive patches when water is present. What we were doing was creating the "seed bank" that would remain until favorable growing conditions prevail. Yesterday was the first of March and we decided it was time to start thinking about spring. Pleasant Valley Conservancy has been fairly quiet this winter, since the deep snow has kept us from doing any significant brush work. Hard to believe that a few years ago we were able to work all winter on brush, often even in shirt sleeves. This is the third heavy snow winter, great for skiers, but bad for restoration ecologists. We generally plan to do our major brush control work in the winter, but not this year. Among other things, I was wondering about our GMC pick-up truck, which had been sitting in its parking spot since the middle of December. Would it even start? We really count on this truck for all sorts of work, among which the most important coming up is a whole series of prescribed burns. (The truck holds our slip-in pumper unit.). When I opened the truck door, the first thing I checked was the door light, to see if the battery had run down. Good news. The light was working. Even better news, the starter motor turned over vigorously and the engine instantly fired up. Impressive. 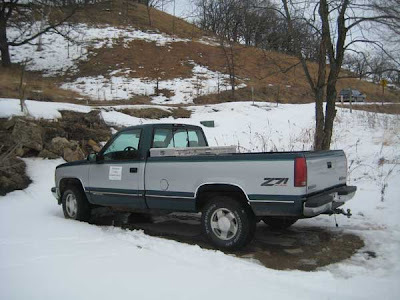 Since the truck was surrounded by snow, I shifted into 4 Low, revved the engine, and backed out of the parking space and continued right up the hill to the road without stopping. Experience told me I didn't want to back down the hill and then try to go up in forward, since I might get stuck in all those snow drifts. But with good momentum and judicious use of the rear-view mirror, I was able to bring the truck right up onto Pleasant Valley Road, which was snow-free. Kathie and I then took a tour of the Town of Vermont in order to charge the battery. I then put the truck back in its parking space. With so much snow still on the ground, it is hard to believe that in a few weeks we will be doing our first prescribed burns! The start of another prairie year! 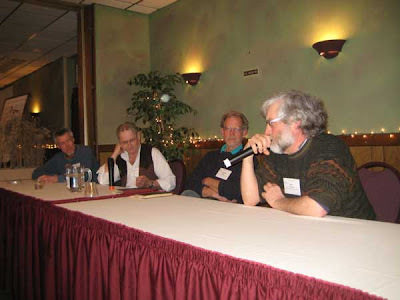 On Saturday, Feb 27, 2010 the Annual Banquet of the Prairie Enthusiasts (TPE) was held in Monroe, WI, hosted by the Prairie Bluff Chapter. 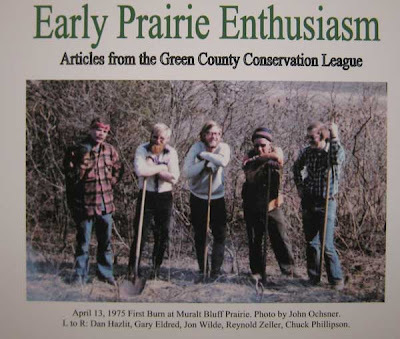 Members of this chapter were part of the founders of TPE and conducted the first burns on prairie remnants. These early prairie people had been good friends since their high school days, and had been aware, from work at the U.W. Arboretum, that prairie fires were beneficial. They decided to give fire a "try" at Muralt. They had a lone drip torch, a few shovels and rakes, but no water. The day was windy with fairly low humidity, perfect conditions for an "escape", and this is what happened. Eventually the fire department arrived, but by then the fire had put itself out. The exciting thing was what happened later. The prairie flourished, and in August there was a huge population of rough blazing star (Liatris aspera). The Green County Board of Supervisors were so impressed that they purchased Muralt Prairie to protect it in perpetuity. 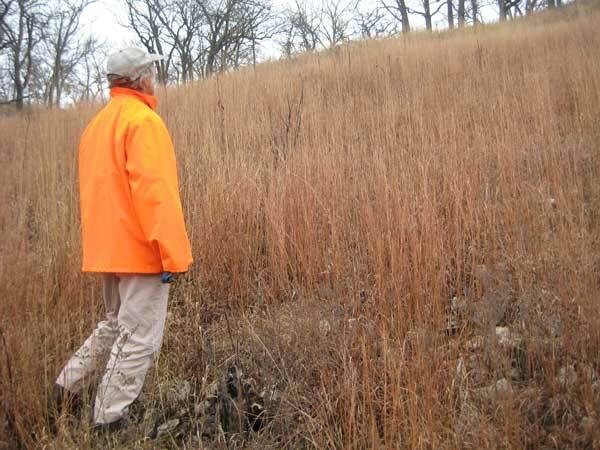 From this modest beginning, the Prairie Enthusiasts eventually rose, and is now a three-state organization with over 1000 members and nine chapters.